HOMEWhat is ‘consultant led care’ and why is it so important? What is ‘consultant led care’ and why is it so important? “The NHS is in crisis”. How often do we hear this statement? And do we really know what it means? At the end of the day, the NHS is such a huge machine. And no one has a clear idea of ‘why’ it is broken much less ‘where’ it is broken. But broken it is. Waiting lists, working conditions, lack of funding and the sheer level of demand have all been worthy scape goats over the years. But, as yet, we’re still to truly understand the real complexity and severity of the situation. We’ve seen nurses and junior doctors in the headlines. Midwife numbers are in crisis. And now there are fears of an exodus, as family GPs threaten a walkout. Injured? Ill? Go to your GP and wait patiently for their diagnosis. Then wait patiently for the referral. Even once you’ve met your consultant you’re likely to be referred back to your GP. You are at the disposal of an ever-expanding medical support team and their overburdened waiting lists. And you’re relying on non-specialist medical professionals to co-ordinate and summarise your treatment needs. There has been much talk of consultant led care over the years. Back in 2012, the Academy of Medical Royal Colleges carried out detailed research into the benefits of consultant led care. The summary of its report highlighted clear evidence of key benefits including: rapid and appropriate decision making, more efficient uses of resources, GP’s access to the opinion of a fully trained doctor and improved patient outcomes – with a noticeable difference in morbidity and morality. Furthermore, consultant care is associated with faster patient processing and decreased hospital stays. A win-win situation. Consultant-led care is common practice abroad. And most private UK clinics also operate this process of care. One such organisation is Avicenna Clinic, based in central Peterborough. 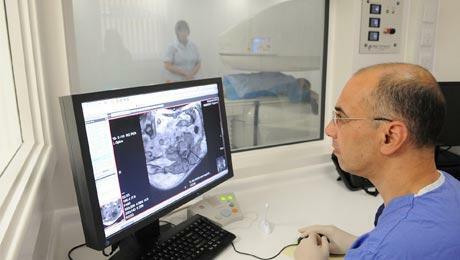 Established by consultant radiologist, Hany Elmadbouh. “I’ve been a consultant radiologist for 20 years, working in both the NHS and private practice. I can see that, where consultants see patients, diagnose and plan treatment options, patients recover quicker and see better results from their treatments. “I work in radiology. Often, I see patients who are suffering from acute pain; joint and spinal injuries being the most common complaints. No one wants to be in pain for any extended period of time. Avicenna Clinic, a purpose-built clinic, which opened its doors in April this year has seen a huge demand from patients who are looking to avoid the long waiting lists they face on the NHS. Local businessman Bruce Dodworth was one such patient who underwent a ground-breaking procedure at the clinic in June this year. Having ‘slipped a disk’ he found himself immobile and in complete agony. With the prospect of surgery on the cards, he visited the clinic to undergo a full diagnosis and obtain a referral to spinal surgeon, Mr Wojcik. Within two weeks, and a couple of appointments, Bruce had been assessed, had a diagnostic MRI scan and undergone a ground-breaking treatment; an MRI Guided Injection. The pain relief was instant and enabled him to resume 70% normal functionality immediately. “When in pain, patients need to return to normal posture and movement to aid recovery. Without this, the cycle of pain continues. Because I was leading the care and treatment process, we were able to streamline Mr Dodworth’s treatment. This is just one example where the case for consultant led, expedited care, has proven to be worth its weight in gold. It is now for us – as patients – to understand that we do have a choice. We don’t have to wait. And we can define our own care needs.